I called this my Easter BBQ grilled rabbit recipe because I cooked it at Easter and I must confess it's somewhat unfortunate that there may be some confusion with the Easter bunny. I can assure you that none was intended. Flavor-wise, rabbit is similar to chicken. It's a light colored meat too but with a lot less fat. You'll find farmed rabbit meat lighter in colour than wild rabbit and if you want to lighten the colour of wild rabbit meat then soak it in cold water for a couple of hours. There's a reasonable amount of meat on there and one rabbit will serve two people. If buying fresh from your butcher, look out for plump, pink rabbits that smell nice and fresh. Like with fish, check the eyes - they should be bright and clear. Check inside the carcass and look at the kidneys, a good amount of white fat surrounding the kidneys indicates a younger, healthy rabbit that has had plenty of food throughout its life. I'm not a fan of intensive farming and more often these days you'll find that the rabbit in your butcher might have been farmed. It seems silly to farm rabbit when wild rabbit is completely free range and in plentiful supply but I guess it all comes down to the costs getting it to the consumer. 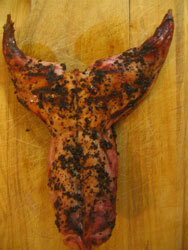 If you are into hunting and cooking then use this link to see how to skin your own rabbit. So for this recipe you want to ask for a saddle, jacket off. You can see form the picture that by taking the saddle you get a nice piece that can be flattened out ready for the grill. There are no allergens in my grilled rabbit recipe. Place the juniper berries, sugar and salt in a pestle and mortar and grind the berries until you have your rub then simply spread it all over the rabbit. Give the rub up to an hour to penetrate and build some flavor into the flesh. Over medium hot coals grill the rabbit for ten minutes on each side and that's it. Savor the bitterness of the juniper berries with the sweetness of the sugar. Rabbit is a very lean meat and will easily dry out if overcooked so it's important to keep a temperature probe close by and keep a check on the core temperature of the rabbit during to cooking. Ultimately you're looking for a temperature of 70°C (168°F) but what I recommend is to take it of the heat when you hit 65°C (150°F) and let it rest for 5 or 10 minutes. The resting process will help retain the moisture in the rabbit and the temperature during this phase will slowly continue to climb. My grilled rabbit recipe goes well with all sorts of grilled veggies, grilled potato halves or if it's a warm day then try it with my cannellini bean salad. Note: The one negative for me about rabbit is that it is quite a bony animal and a lot of the bones can be quite small. Not so small that you might not notice them but certainly smaller and more abundant than you would find in a chicken. Keep your eyes peeled for bones when eating but please don't let this put you off grilling a rabbit or indeed trying this recipe.